As March - Women's History Month - comes to a close, it's a good time to reflect on those women artists in the past who have paved the way for women artists today, challenging fiercely held stereotypes and creating great art. As part of an organization that is helping female artists to gain greater access to the marketplace, I often think about the barriers that keep women from making their living as professional artists. Widespread misconceptions lie at the heart of this inequity: primarily, the notions that there are simply not enough women producing collectible, or even just good work and that they only produce a certain kind of work - from photos of babies, to quilts and weathervanes. These myths continue to limit them to the sidelines of the art market. On the bright side, women today have greater access to higher education in the arts, and in fact, represent the majority of graduates holding degrees in the visual arts. Their forerunners, however, did not have this advantage, as the means of art production in western cultures was a privilege for largely white male artists until well into the 20th century. While the art historical canon and mass media have expanded to recognize the many deserving women who broke the mold, female artists are still grossly underrepresented within institutions and commercial entities. The fact that only 5% of art on display in U.S. museums is by women is a testament to the continued prejudice and lack of access that still plagues female artists. "Before Annie Leibovitz and Margaret Bourke-White, there was Jessie Tarbox Beals," observed The Harvard Gazette in 2011. Jessie Tarbox Beals is regarded as the first woman officially hired as a staff photographer for a newspaper in 1902. As a photojournalist, Beals defied female stereotypes, taking on what was considered "a man's work." She often worked outdoors carrying a large format camera through the streets of New York chasing newsworthy images, from social causes to the bohemian goings-on in Greenwich Village. Beals was also renowned for her portraits, demonstrating her "straight" photography approach. She seized every opportunity to make connections to photograph prominent figures in politics and the arts. Towards the end of her life, Beals admitted that her profession had taken its toll on her health and quality of life. Through her sheer tenacity, Beals, nonetheless, paved the way for a range of influential women photographers. Clara E. Sipprell, who opened her Greenwich Village photo studio in 1915, is known for creating stunning portraits of actors, artists, writers, scientists and thinkers. 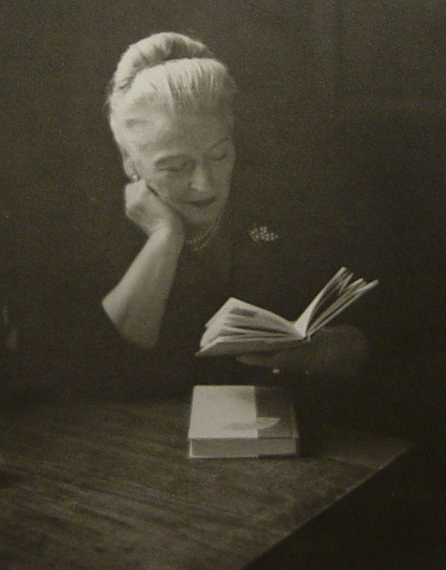 Sipprell notably established her own standards for photography by rejecting the use of artificial lighting and post-editing darkroom techniques. This vision combined with her superior abilities set her apart and resulted in an impressive roster of eager subjects, including Pearl Buck (as depicted in the accompanying photo), Albert Einstein, Robert Frost, Langston Hughes, Eleanor Roosevelt, and Ida Tarbell. Sipprell is also known for applying her high photographic standards to pictorial landscapes and cityscapes. She cites a number of influential New York photographers as her teachers, but it was her work New York-Old and New that became one of the first photographs added to the collection at the Museum of Modern Art in 1932. Renowned figurative sculptor Malvina Hoffman traveled to Paris in 1910 with a mission to study with Auguste Rodin. Her persistence paid off; however, it was her artistic ability that ultimately impressed him, as Rodin took her on as a student for four years. Hoffman became a master at calculating the requirements for working with heavy, large scale materials such as clay, stone, and bronze. Committed to the rigor of her field, she become an innovator and created the supports and apparatus that allowed her to sculpt and cast her works in her own studio without assistance. She later published a technical book that included information on bronze casting titled Sculpture: Inside and Out. In 1929 Hoffman was approached by Stanley Field, president of the Field Museum in Chicago to consider participating in a project that would come to serve as a type of cultural biography titled Races of Man. Field envisioned a massive installation of figurative sculptures modeled by multiple artists who would travel the world and represent diverse races. Hoffman's artistic vision and capacity to execute it earned her the entire commission. Her five years of intense travels resulted in an extraordinary 104 bronze sculptures, which she deemed "a sculptor's interpretation of Humanity, studied from three angles--Art, Science, and Psychology." In its first year, the Races of Man exhibition was visited by over 2 million people. All of these women made a significant contribution to history because of their vision, passion and skills, regardless of the fact that they were women. The fact that they were women and had the determination to make a way for their art based on the merits of the work and on the terms of their field, earns them the right to be honored as pioneers - and their legacy is our legacy.